Commissioned by the International Union of Crystallography (IUCr), CIF consists of a very rich set of descriptors, allowing a file to contain raw and processed experimental data, a detailed experimental log, information about subsequent structure solution and refinement cycles, and a complete description of crystal and chemical structure and connectivity. A small excerpt from the standard example file for submissions to Acta Crystallographica Section C is presented here; the complete file can be viewed at ftp://ftp.iucr.org/pub /example.cif. 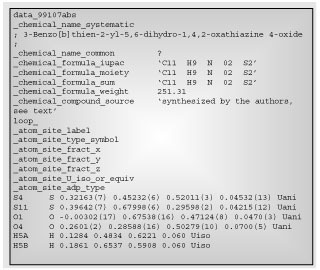 The same file may be transferred from diffractometer to computational workstation to molecular graphics software, with each program in the chain importing and adding data. Authors using text editors or more complex editorial tools to create a full commentary and discussion of the structure may further extend the same file. Consequently the journals of the IUCr require all supplementary files recording crystal structure data to be in CIF format, and two of its journals will only accept papers submitted in this format. Such submissions are not only accepted and transformed by typesetting software into formatted research publications, but their embedded data are extracted and subjected to a battery of analytical and diagnostic calculations that provide referees with an objective assessment of the quality and consistency of the reported results. The consequence of adopting such a standard is that data exchange becomes more efficient, computation is facilitated, transcription errors are removed from the publication process, and the quality of published data tends to improve. Overall, publication of structural reports journals becomes more efficient, onward transmission of the results to databases is also simplified, and readers may see any published crystal structure in three dimensions (and interact with the structure, generating stereo pairs, packing plots, and hydrogen bond networks ad libitum with the appropriate browser plug-ins or helper applications). CIF has a somewhat different and rather simpler structure than XML. This is largely because it was developed at a time when SGML, the precursor of XML, was expensive and unwieldy to work with. Nevertheless, it is clear that automatic transformation between CIF and suitably devised XML formats is entirely feasible. Since its earliest days the CIF community has worked with pioneers in the chemical information field to work towards interoperability with emerging chemical information standards. Brian McMahon <bm@iucr.org> is research and development officer at the International Union of Crystallography in Chester, United Kingdom. Page last modified 27 June 2002.